Free Printable Alaska Crossword Puzzle. Free Printable Alaska Crossword Puzzle, that you can use for you next history or social studies class. If you are looking for a crossword puzzle about Alaska for your students, this Crossword can be a great resource. Help Kids learn at school having fun at the same time solving this crossword puzzle. The crossword includes 16 words and facts related to Alaska. Solve this crossword with words like Juneau, Balto, Oil, Gold, Iditarod, Dogsled, Tourism, Igloo, Prudhoe and many more. 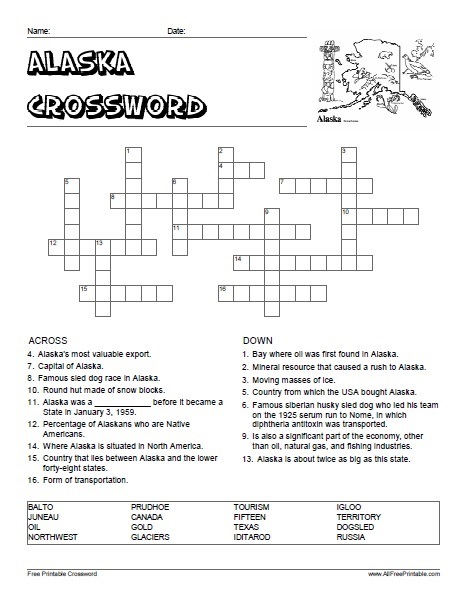 Click the link below to download or print the Alaska Crossword Puzzle now in PDF format. Find the solution on 2nd page.